Diagram Studio is intuitive to use. Anyone familiar with graphics or engineering programs will have no trouble navigating it, but there's a Help file as well as an extensive tutorial for those who need more guidance. 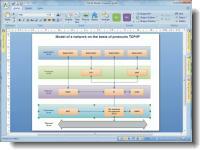 The tutorial explains how to use Diagram Studio effectively and efficiently. We created a new document and experimented by inserting shapes and text into it. You can choose from a variety of shapes or you can draw your own. Text is added to your document by inserting a Text Box. There are many fonts from which to choose, and you can change the color and shapes of your text. You can insert objects like pictures and even change the size of each object you drop into the document. The variety of file formats that you have to choose from when saving your document makes it useful for many purposes. Java control to manage workflow, flowchart, network, organizational diagrams. Qweas is providing links to Diagram Studio 5.6 as a courtesy, and makes no representations regarding Diagram Studio or any other applications or any information related thereto. Any questions, complaints or claims regarding this application Diagram Studio 5.6 must be directed to the appropriate software vendor. You may click the publisher link of Diagram Studio on the top of this page to get more details about the vendor.